For the pitch however it should be out of tune unless we use the same clock seb use to derive is frq conversion, I think the relation between the note should be kept. Correct, so it will be "in tune with itself" but out of tune with other things. I think I'll rewrite the code for pitch --> frequency conversion derived from a master clock. I'll also port it to Arduino (will be super simple). how simple is it to change the code to work with arduino? ive been considering porting some rgb code to teensy. id like to figure it out. according to this it should run without any modification to the code. but it can be tuned by tweaking the code? standalone midi input would be awesome.. might have a play with that..
damn, you're coding faster than the post around here! why did I think that was a compliment? Anyway.. good feels all round. I was chilling in my lunch break. finally got some SN76489 chips in the post! 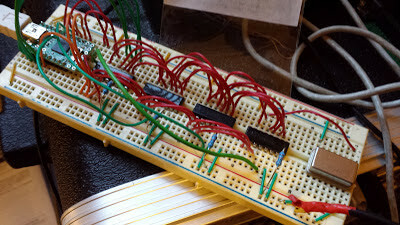 Breadboarded up this badboy. My only issue so far is the tuning is out. I'm using a 1.8Mhz osc but everything is a good step and a half out. Would it be easier to mess with the pitch tables or look for a different oscillator? I reckon it might be easier to mess with the pitch table BUT I want to rewrite this with a variable for clock speed anyway, thanks for reminding me!! • Pitchbend is musically linear, meaning that the same value pitch bend will give the same pitch distance no matter which pitch is played. • CC71 on MIDI channels 1 - 4 sets the pitch bend range in semitones. The default is 12 semitones. • The frequency data for the SN76489 is calculated using a formula rather than a look up table. • The advantage of this is there is a line of code in the program that reads: long clock = 1843200; Simply change the value of clock in Hz to support any value of crystal oscillator whilst staying in tune! • The default is 1843200 (i.e. a clock speed of 1.8432 MHz) as this is the crystal speed that I prefer, however the SN76489 can accept a wide range of clock speeds. If you want a bassier pitch range, simply use a lower value crystal oscillator. Today I started adding support for a quad SN76489 setup from the one Teensy. The basic functionality works great - note on / off, pitch bend and noise channels. I have 2 channel of square waves on Ch 1+2 and noise on ch3.. is this right.. the demo has 3 channels of square wave.. am I just sending my CCs wrong?